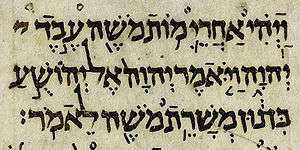 The Book of Numbers (from Greek Ἀριθμοί, Arithmoi; Hebrew: בְּמִדְבַּר‎, Bəmiḏbar, "In the desert [of]") is the fourth book of the Hebrew Bible, and the fourth of five books of the Jewish Torah. The book has a long and complex history, but its final form is probably due to a Priestly redaction (i.e., editing) of a Yahwistic source made some time in the early Persian period (5th century BCE). The name of the book comes from the two censuses taken of the Israelites. Numbers begins at Mount Sinai, where the Israelites have received their laws and covenant from God and God has taken up residence among them in the sanctuary. The task before them is to take possession of the Promised Land. The people are numbered and preparations are made for resuming their march. The Israelites begin the journey, but they "murmur" at the hardships along the way, and about the authority of Moses and Aaron. For these acts, God destroys approximately 15,000 of them through various means. They arrive at the borders of Canaan and send spies into the land. Upon hearing the spies' fearful report concerning the conditions in Canaan, the Israelites refuse to take possession of it. God condemns them to death in the wilderness until a new generation can grow up and carry out the task. The book ends with the new generation of Israelites in the Plain of Moab ready for the crossing of the Jordan River. The Israelites set out from Sinai. The people murmur against God and are punished by fire; Moses complains of their stubbornness and is ordered to choose seventy elders to assist him in the government of the people. Miriam and Aaron insult Moses at Hazeroth, which angers God; Miriam is punished with leprosy and is shut out of camp for seven days, at the end of which the Israelites proceed to the desert of Paran on the border of Cannan. Twelve spies are sent out into Canaan and come back to report to Moses. Joshua and Caleb, two of the spies, report that the land is abundant and is "flowing with milk and honey", but the other spies say that it is inhabited by giants, and the Israelites refuse to enter the land. Yahweh decrees that the Israelites will be punished for their loss of faith by having to wander in the wilderness for 40 years. Miriam dies at Kadesh Barnea and the Israelites set out for Moab, on Canaan's eastern border. The Israelites blame Moses for the lack of water. Moses is ordered by God to speak to a rock but disobeys, and is punished by the announcement that he shall not enter Canaan. The king of Edom refuses permission to pass through his land and they go around it. Aaron dies on Mount Hor. The Israelites are bitten by Fiery flying serpents for speaking against God and Moses. A brazen serpent is made to ward off these serpents. The Israelites arrive on the plains of Moab. A new census gives the total number of males from twenty years and upward as 601,730, and the number of the Levites from the age of one month and upward as 23,000. The land shall be divided by lot. The daughters of Zelophehad, their father having no sons, are to share in the allotment. Moses is ordered to appoint Joshua as his successor. Prescriptions for the observance of the feasts and the offerings for different occasions are enumerated. Moses orders the Israelites to massacre the people of Midian. The Reubenites and the Gadites request Moses to assign them the land east of the Jordan. Moses grants their request after they promise to help in the conquest of the land west of the Jordan. The land east of the Jordan is divided among the tribes of Reuben, Gad, and the half-tribe of Manasseh. 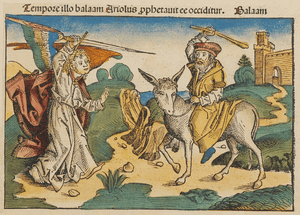 Moses recalls the stations at which the Israelites halted during their forty years' wanderings and instructs the Israelites to exterminate the Canaanites and destroy their idols. The boundaries of the land are spelled out; the land is to be divided under the supervision of Eleazar, Joshua, and twelve princes, one of each tribe. The majority of modern biblical scholars believe that the Torah (the books of Genesis, Exodus, Leviticus, Numbers, and Deuteronomy) reached its present form in the post-Exilic period (i.e., after c.520 BCE). The five books are often described as being drawn from four "sources" - schools of writers rather than individuals - the Yahwist and the Elohist (frequently treated as a single source), the Priestly source and the Deuteronomist. There is ongoing dispute over the origins of the non-Priestly source(s), but it is generally agreed that the Priestly source is post-exilic. The theme of the divine-human relationship is expressed, or managed, through a series of covenants (meaning treaties, legally binding agreements) stretching from Genesis to Deuteronomy and beyond. The first is the covenant between God and Noah immediately after the Deluge in which God agrees never again to destroy the Earth with water. The next is between God and Abraham, and the third between God and all Israel at Mount Sinai. In this third covenant, unlike the first two, God hands down an elaborate set of laws (scattered through Exodus, Leviticus and Numbers), which the Israelites are to observe; they are also to remain faithful to Yahweh, the god of Israel, meaning, among other things, that they must put their trust in his help. 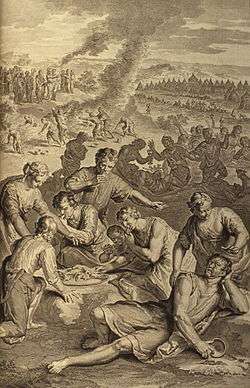 The theme of descendants marks the first event in Numbers, the census of Israel's fighting men: the huge number which results (over 600,000) demonstrates the fulfillment of God's promise to Abraham of innumerable descendants, as well as serving as God's guarantee of victory in Canaan. As chapters 1–10 progress, the theme of God's presence with Israel comes to the fore: these chapters describe how Israel is to be organised around the Sanctuary, God's dwelling-place in their midst, under the charge of the Levites and priests, in preparation for the conquest of the land. 1 2 3 McDermott 2002, p. 21. 1 2 Carr 2000, p. 492. 1 2 Ska 2006, p. 38. Carr, David (2000). "Genesis, Book of". In Freedman, David Noel; Myers, Allen C. Eerdmans Dictionary of the Bible. Eerdmans. Dozeman, Thomas (2000). "Exodus, Book of". In Freedman, David Noel; Myers, Allen C. Eerdmans Dictionary of the Bible. Eerdmans. Houston, Walter J (2003). "Leviticus". In Dunn, James D. G.; Rogerson, John William. Eerdmans Bible Commentary. Eerdmans. Carr, David M. (2016). 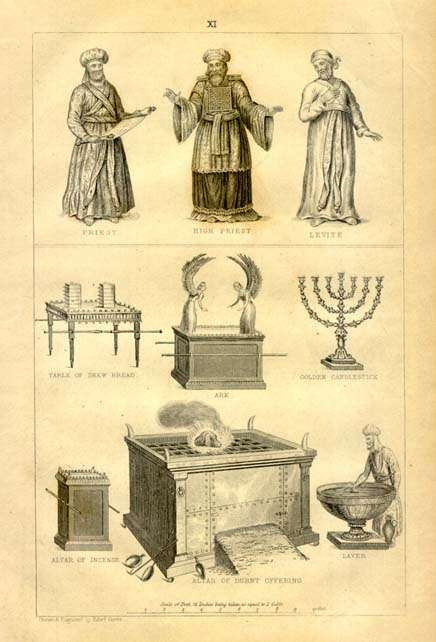 "The Formation of the Hebrew Bible". In Niditch, Susan. The Wiley Blackwell Companion to Ancient Israel. John Wiley & Sons. Fretheim, Terence E (1998). "Numbers". In John Barton. Oxford Bible Commentary. Oxford University Press. ISBN 9780198755005.